How does capitalism affect health? In this post I will introduce one of the most important analytical concepts in sociology (and many other disciplines) capitalism and how it can help us to understand health inequalities. For our purposes the most important thing to know about capitalism is that it is an economic system (a social structure) which is based on private property, profit and “markets”. This is the third in a series of posts which I have written alongside a module I will be teaching which is intended to help non-sociology students to gain an understanding of the sociology of health and illness. While these posts are primarily intended for that audience and are therefore intentionally introductory there might be something of interest to a more general audience. For that reason I have decided to put them on my blog in amongst more specific and specialist writings. One of the key aspects of capitalism which makes it distinctive from other forms of economic and social organisation is that the majority of the people “sell” their labour. That is, most people get food and shelter as well as luxuries from “the market” (they buy them) and they get the money to buy these things by working for someone else who pays them wages or a salary. These are the majority of people in society (who Karl Marx called the proletariat). The minority are those who they work for who “buy” the labour of the workers, they do not work in the same way but live of the labour of their employees, that is, they take the profits. These are the minority (who Marx called the bourgeoisie). The bourgeoisie are able to make a profit because they sell the products which their employees make for more than they cost to produce and take the difference. We can think of this through a basic formula. For Marx, and many other people, this fundamental aspect of social organisation in capitalism causes tensions because it pits the two groups against one another. It is in the interests of the bourgeoisie to keep prices high and wages low and it is in the interests of the proletariat to keep prices low and wages high. The balance of power between these two groups is, however, uneven. The bourgeoisie tend to also be closely connected to governments and legislators so more often than not they get what they want (low wages and high prices). What does this all have to do with health? In the previous post in this series I presented some data which showed how there are higher rates of premature death amongst men from a “Routine or manual” rather than “Managerial or professional” background. Another example gives this some more nuance. The charts above show children are less likely to eat fruit and vegetables the lower their household income. This suggests that the low income of some families (and the high prices of fruit and vegetables) has some impact on the likelihood of children eating healthy food and therefore their general health outcomes. It seems possible then that the social and economic structures of capitalism, which tend towards low wages and high prices (due to the power imbalance between the bourgeoisie and proletariat), might be making some people unhealthy. Another graph shows this in a more global context. 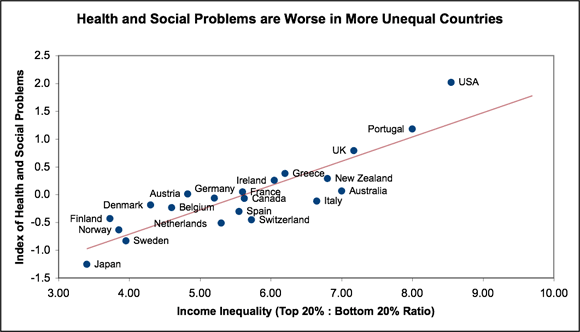 As we can see above the more unequal a country is (the greater the difference is between rich and poor) the more likely there are to be health (and social) problems. In the next post in this series I will explore the sociological concept of power. Previous Previous post: Is the real purpose of the panopticon to keep us working? Next Next post: Does self-tracking increase the healthicization of everyday life?